When we ate at our son Aaron's apartment recently, to go with spinach salad and roasted green beans, he made grilled tofu sandwiches. 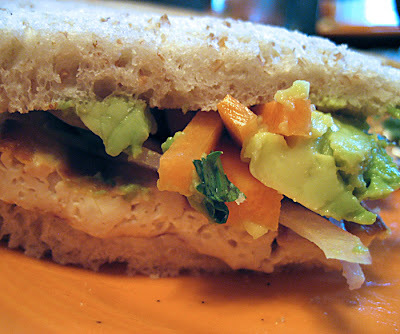 He based his recipe on a sandwich he had at Baguette Box, a restaurant in Seattle, where he lives. These sandwiches were delicious and satisfying, although he said the original ones have deep fried tofu, making them even more tasty. However, grilling the tofu is healthier and less fattening so I'd go with this version. This recipe is a bit more involved — it requires some marinating, and making an easy sauce— but the result is really worth the modest effort. 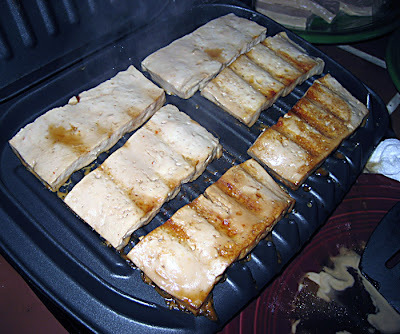 Marinate the tofu slices in a shallow pan for at least one hour (or overnight). After the tofu marinates, Aaron cooks it on a George Foreman grill that someone gave him. I don't have one of these so I'd probably just pan fry it in a small amount of olive oil, or maybe use the grill on my waffle iron. Julienne (or grate if you're feeling lazy) two carrots and marinate them for an hour in the 2 tablespoons sugar and 2 tablespoons red wine vinegar. Mix together the 1/4 cup veganaise with the 2 tablespoons lemon juice, 1 clove minced garlic, 1/8 teaspoon cayenne, salt and pepper to make the vegan dressing. Assemble the sandwiches with grilled tofu, red onion, avocado, marinated carrots and cilantro. Spread the bread with dressing. 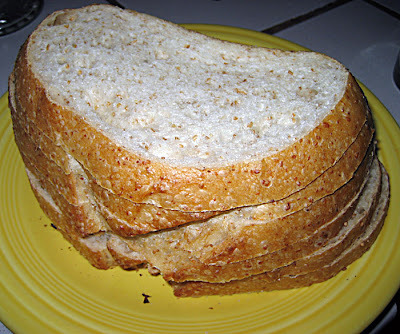 I was in the kitchen thinking about the great sandwiches Aaron made for us, and I started wishing there was some bread in the house so I could make a sandwich. I considered baking bread, but it was way too hot. Too, too hot. I was thinking I would stroll on down to Trader Joe's and have a look around, when out of the corner of my eye I spied the breadmaker, sitting unused on the counter. I hardly ever use the breadmaker to bake bread. It's mostly used to make pizza or bread dough that gets baked on a stone in the oven. But I COULD use it to bake bread. All the ingredients were in the cupboard. I was feeling a twinge of guilt. So I spent about five minutes adding ingredients to the machine and went off to accomplish something while it made bread. It made a very credible loaf of 100% white whole wheat that made an excellent sandwich of thin sliced sautéed eggplant, avocado, tomato, cucumber and homemade vegan sausage. And here's the problem. After I soaked the pan, I discovered a lot of crusty gunk under the washer-thing on top of which the mixing blade sits. I don't think this washer-thing is even supposed to come off, but at this point in the bread machine's life, it does. After I scraped everything out with a toothpick and examined it, I couldn't tell if it was old dough gunk or old washer gunk. What if I scraped out the hardened remains of some dried out rubber part? The shaft seemed a bit wobbly. So off to the Internet I went to look up replacement parts just in case, and was disturbed to find that the the only replaceable part on my machine is the little dough paddle. Some models have a replaceable pan (not my model) but the cost with shipping is about $55, making such a purchase seem weird. That machine is BIG and will take a lot of space in a landfill if I've wrecked it. I hate this. I just hope the unsavory gunk I obsessively cleaned was old dough and not old, unreplaceable machine part. By the way, I have a Breadman Ultimate TR22ooC. Thanks for all the marinade recipes. Those are great.